“Play is the work of a child” -Maria Montessori Beyond Your Ordinary Recreation (BYO) began with a backyard swing set and a dream to expand play across the country. For over 15 years, BYO has grown into a national leader in playground design and innovation. We specialize in creating adaptive play spaces that encourage social, emotional and physical development. Our expanded product lines include park, sports, pool and patio equipment. We know that play is more than fun; it’s the key to a healthy, happy life for children and adults. This year we are proud to continue making strides toward our goal of bringing more play to more communities across the country through our Create More Play Program. We believe that play is a basic human right and throughout the year we will be offering dollar for dollar fund matching on a limited quantity of customizable play structures. As we continue to grow, our biggest priority continues to be customer satisfaction. We pride ourselves on providing quality services, products and advice. All of our structures are custom manufactured in the United States from the highest quality materials available and meet or exceed all industry guidelines and standards. Our entire staff is dedicated to your service and satisfaction not only through the design and installation stages but also for the life of your playground. - Karen, Comotara Homeowners Assn. Beyond Your Ordinary Since 1999 BYO Recreation has been serving the nationâ&#x20AC;&#x2122;s playground and recreation needs since 1999, offering Beyond Your Ordinary customer service and products. 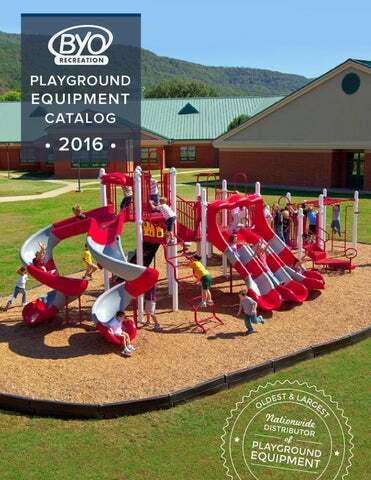 We are the oldest and largest nationwide distributor of playground equipment in the United States, and we only distribute high quality, made-in-the-USA products from the best, most experienced manufacturers. BYO is one of the only distributors in the country that has an in-house Computer-Assisted Design (CAD) team. Our design team will create a custom, one-of-a-kind rendering based on site plans, accessibility, safety, preferred activities, and age group. From there, our certified National Installation Team can bring your playground from dreams into reality. From start to finish, BYO Recreation has you covered! Age Groups for Playground Structures Our unique modular designs allow you to design a play structure around your desired audience. All our structures fall into three age ranges: infant – 23 months, 2-5 years and 5-12 years. These age specific structures are designed to promote a variety of play activities targeted toward physical, social and cognitive milestones. Our targeted approach to play structures creates a rich and fulfilling experience that encourages a child’s natural desire to explore his or her own limits and abilities. Contact one of our Playground Specialists at (800) 853-5316 to discuss your project in detail. Infant & Toddler Play Structures Our infant and toddler play structures are designed to promote early childhood milestones such as gross and fine motor development through multi-sensory experiences. Providing toddlers a safe place to climb and explore, our structures help children develop balance and coordination. Ground level activities encourage infants to get involved in active play by placing the fun on their level. While our specially designed climbers and slides help toddlers develop the confidence to explore and play independently. 2-5 Year Old Play Structures Preschool age children are developing greater mobility and agility. Play structures for this age group introduce obstacles that require greater balance and coordination. Multiple slides and climbers help ensure that these structures engage and challenge children as they grow. 5-12 Year Old Play Structures Children this age are working hard to fully refine their gross and fine motor skills and are ready for the most thrilling and challenging play structures. Higher, curved or double slides are optimal for this age range, as are climbers that encourage the development of upper body strength. Balance beams, fireman’s poles, rock walls and horizontal ladders are great ways to incorporate more challenging play. Create a Completely Custom Playground with BYO With our easy design process, creating a fun and unique play space is easier than ever. All of our modular playgrounds are fully customizable allowing you to pick and choose your favorite components, colors and layouts. You can begin your design process by selecting and customizing one of our popular play designs or by describing your needs to one of our in-house playground designers. We will work with you 100% FREE OF CHARGE to design a completely customized structure. With a BYO Recreation Playground the options are truly limitless. Choose Your Age Group When planning your playground, the age range of children that will be enjoying the playground determines the size and deck heights of your custom playground. Your Custom Playground Structure When you order a custom play structure from BYO you will work side by side with our design experts to create an immersive play experience tailored to your organization, children’s needs and budget. You will also be presented with a 3-D rendering of your proposed playground in the colors of your choice. This free, no obligation design service allows you to better envision your new playground and is a great tool for “selling” your new playground to committee members or prospective donors. Color Options All of our playgrounds are available in the custom color scheme of your choice. You can match your playground to the surrounding neighborhood, surrounding areas or your school colors. This design feature also allows you to create immersive ‘themed’ play areas that are perfect for encouraging imaginative play. CHOOSE ONE OF OUR CONVENIENT COLOR PALETTES BELOW OR CREATE YOUR OWN! Timeless Fun for All Ages Swings offer a fun and stimulating experience for children of all ages while improving coordination, muscle tone and endurance throughout the body. Swinging provides children with mental stimulation, promotes special awareness and encourages confidence and independence. www.byoplayground.com or call (800) 853-5316. When building your new swing set, you must consider the area or use zone for the swing set. The use zone is the possible area that a child could fall and should be free of other obstacles or equipment. Each swing bay gets 2 swing seats. Swing seats must match within each bay, but can be different from bay to bay. **Different Swing Sets come with different seat options. Swings promote upper body and leg strength, while also building agility. The high quality construction gives you the confidence that comes with a safe, sturdy heavy duty swing set. MAKE YOUR MULCH LAST LONGER! Free-standing Play Equipment for Even More Fun! We offer a wide selection of Independent Play Structures that help you customize your play space. Our wide selection of spring riders, balance beams, climbers, tunnels, spinners and see saws allow you to add even more fun to your new playground. Are you planning your playground around a specific theme or trying to incorporate more fitness activities into your space? Our Independent Play Structures can make it happen! With multiple safety features, these energetic playground structures are a perfect way for kids to spring deeper into their imaginations. Our wide selection is perfect for enhancing themed playgrounds. Spinners encourage core strength, balance and endurance while demonstrating the basics of centrifugal force. These popular structures offer big thrills while requiring a relatively small use zone. Climbers are the most versatile of all playground structures and range from traditional horizontal ladders to rock climb walls. Climbers help improve coordination, strength and endurance while providing growing children the opportunity to take calculated risks. Risk taking is a natural and necessary part of learning and play. Providing a safe place to take risks allows children to test their limits, form a strong sense of self and become more independent. Climb & Discover Cave •	Nature discovery elements on interior walls of climber. •	Unique, durable rock-climbing formation with 2 different handhold options. •	Openings on both sides and ends allow easy supervision. •	In-ground mount included. ALL NEW Interactive Play Panels Our new panel designs offer a large selection of events - allowing for the introduction of music and sound, teaching cause and effect, or adding a fun, interactive game to the playground! Balance beams encourage graceful, smooth movements and are among the most challenging of play structures. More ridged, low beams are perfect for preschool age children, while higher, more flexible beams provide an added challenge for older age groups. Total Body Fitness through Play Our specially designed fitness circuits can turn your playground into a fun fitness event. These play structures are designed to promote more active and challenging exercise during play. Because of their challenging nature, Fitness Circuits make a great addition to team building exercise programs as well as free play! These specialized structures incorporate more challenging transitions between activities, more upper body and balance obstacles and the most challenging climbers. Finishing Touches for Your Facility Complete your project with our beautiful and functional site amenities. Our relationship with multiple manufacturers guarantees you the widest selection of styles and options available. Coordinate your benches, bollards, waste receptacles and more to create a scenic retreat for all ages. BYO Brand Outdoor Benches, Tables, and Receptacles Starting at $200 BYO Brand Amenities are cost-engineered to provide high quality for a low price. 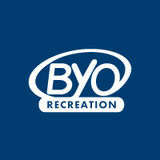 Designed for comfort and durability, our heavy duty commercial amenities are exclusive to BYO Recreation. Recycled Tables, Benches, and Receptacles Starting at $550 Our recycled site amenities are extremely durable and are made to the highest quality standards as well. Safe and Durable Surfacing Options Play area surfacing is one of the most important decisions you will make when designing your new playground. According to the Consumer Product Safety Commission, over 70% of all playground injuries are caused by falls to the ground. All of our playground surfaces can be installed in varied thicknesses that are adjusted to the height of your structure. Our designers will work with you to ensure that your play structure has the proper surfacing for the fall height of your structure. All Surfacing Products meets or exceeds all ASTME, IPEMA and CPSC standards and are specifically designed and manufactured for playgrounds. Loose Fill Surfacing Loose fill surfacing is generally the most economical of all playground surfacing options. Due to its mobile nature some regular maintenance is required to ensure it remains dispersed evenly around your play space. A playground border is recommended for these surfacing options. Engineered Wood Fiber is manufactured from natural wood fibers that are not suitable for lumber. This type of surface is designed to reduce injuries on playgrounds while providing a stable, resilient surface for trails. Because it is an all natural product it will decompose and may require you to ‘top it off’ once or twice a year. Rubber Mulch playground surfacing is impact absorbent, easy to install and virtually maintenance free. This type of surfacing is made from clean, 99% wirefree, shredded recycled tire and will not break down or decompose. Due to the loose fill nature of this product, you may need to smooth the surface occasionally with a rake. Don’t forget your Borders, Timbers, and Ramps! Unitary Surfacing Unitary surfacing offers the greatest level of customization and impact protection. Because it is laid as one piece it also provides the most smooth and stable surface for play. These 2’x2’ rubber tiles are made using a combination of recycled and virgin rubber. Its unique, interlocking design allows for easy installation while preventing curling or separating between tiles. Playground Turf features a unique blend of polyethylene mono filament fibers and a thatch layer that simulates a fine blade of grass. This combination of fibers gives the turf a soft, rich carpet-like feel and results in a visually striking surface. Poured-In-Place (PIP) Poured-In-Place is a porous, two-layered seamless and resilient playground surface that offers virtually limitless graphic possibilities. This Earth friendly product is comprised mostly from recycled materials and may qualify your project for LEED credits or grant money. Poured-In-Place can be customized with logos or designs of your choice! Create a Safer, More Comfortable Playground A shade structure is perfect for covering playground systems, picnic tables, or any other locations otherwise exposed to direct sunlight. All BYO shade structures help prevent sun exposure and limit cancer causing skin damage. Many other custom shapes and sizes are available. Call BYO Recreation for custom design and pricing. entire playground as it will appear in relation to your existing site. Designers will help you plan your site in detail. you throughout the final stages of planning and installation. National Playground Construction (NPC), a BYO Recreation brand, is a nationwide playground installation company offering complete equipment installation and onsite support for most major manufacturers. NPC offers BYO backed customer service and solutions for your playground and recreational needs. NPC is a licensed CGC (Certified General Contractor) and all NPC installers are CPSI certified playground professionals, assuring the quality and safety of our installations. Collectively, we have installed thousands of recreation spaces across the country. Allow us to help you bring your recreation and playground projects to completion. Our NPC professionals make the installation process fast and convenient from start to finish. Allow us to set up your school and classroom projects, we provide White Glove Service for Teachers’ School Supply customers! Safety/Accessibility Your safety is our highest priority. All of our equipment meets or exceeds the rigid public playground equipment standards and guidelines set forth by the Consumer Product Safety Commission and the American Society of Testing Material. Our installers are all certified National Playground Safety Inspectors, and we have certified National Playground Safety Inspectors on our sales and design staff. We design all of our structures to meet or exceed the guidelines set forth by the American’s with Disabilities Act (ADA). If you are seeking a more inclusive play space, our design team will work with your educators, parents or experts to create an environment tailored to your children’s specific needs. CATALOG PRICES/SPECIFICATIONS SUBJECT TO CHANGE WITHOUT NOTICE.